Hey all, Firstly thanks for clicking on my build thread and taking the time to read/look at the pictures. 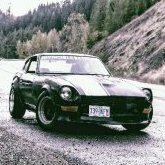 So where do I start, if you read my new members post you will see I picked up this 280z from a friend in a trade deal whereby I swapped my home built s2000 turbo (some say I'm crazy to get rid of it but bah, what the hell.. I knew the s2000 was going to a good home and I love old Z cars.) Here it is when I went round to view it at my friends house... I instantly fell in love... I knew I just had to have it! It already had the SR20DET swap which is a little rough round the edges, but in the PO defence, he had 28 day warranty on the engine so had to get it into the car as soon as he could to make sure it checked out OK. This wasn't long after he had it all up and running. I drove home that night with a huge smile on my face knowing I would be a Z car owner!! My dream car was going to be mine. So the day came to swap the cars, here is an image of the 2 cars together..
Hey to all, I am testing the waters to see what my project's worth as is. I do not have the time to complete this project on my own. I'm willing to throw money at it to finish, but don't know where to take it. I live in Southwest Louisiana in case you're wondering. Refreshed engine - New gaskets, ARP bolts, OEM head gasket Sanded, primed, and bedlined engine bay and cleared with metal flake Borg-Warner 7670D Twin Scroll 1.05A/R About the car: Bought the car in New Mexico. Surface rust beneath the fenders but can be sanded out. No rust on floor boards up front. Surface rust near the back of the seat mounts but nothing serious. I the frame rails need to be repaired as there is rust damage there. No rust around drip rails, or in spare boot. No rust on or around hatch. Illumina adjustable springs and eibach springs bought for front and back. Only back has been installed, along with poly bushings. Carbon Fiber rear spolier and front splitter 5-speed manual that came with the engine Bought but not installed: New weather strip kit for whole car Eibach lowering springs (front) and tokico illumina adjustable (front) Poly bushings for front suspension I have a spare R-200 that comes along with it, but it's not worth much as I thought it was an LSD, which it isn't.